"Work out with me and you'll be shocked by the RESULTS." P90X® is a complete 90-day home fitness system designed to get you in the best shape of your life. Created by trainer Tony Horton, the program includes 12 intense workouts that use resistance and body-weight training, cardio, plyometrics, ab work, martial arts and yoga, along with a nutrition plan, fitness guide and workout calendar. This is the groundbreaking DVD workout that's already changed millions of lives! In 12 muscle-carving workouts, Tony Horton transforms your body from regular to ripped in just 90 days. Get mind-blowing results from P90X—even faster—and save! 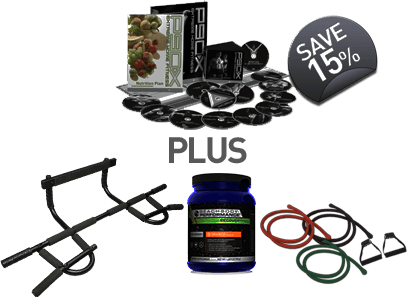 The Deluxe kit includes everything in the Base kit, PLUS advanced P90X fitness equipment and Tony's muscle revitalization shake to get the most out of every workout! The best value of all! 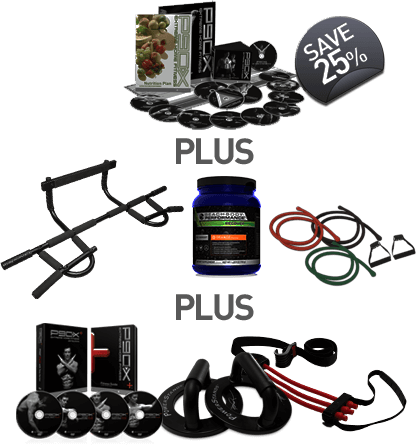 Get everything in the P90X Base AND Deluxe kits, PLUS 5 additional advanced P90X Plus workouts, Tony Horton's exclusive PowerStands®, and the P90X Chin-Up Max to help you knock out more reps on your pull-ups. 12 workouts. Targeted training for lean muscle development and a supercharged metabolism. Fitness Guide and Nutrition Plan. Customize P90X. Choose the Classic, Lean, or Doubles schedule. Calendar and 24/7 support. Track your progress and talk to P90X experts. Phase 1 is a higher-protein diet that jump-starts your fat loss as you begin building muscle. Phase 2 gives your body the energy it needs with a balanced mix of carbs and protein. Phase 3 is an athletic diet with more complex carbs and lean protein for ultimate performance. See what it's like to work out with P90X trainer Tony Horton. Strength routines carve out your best body. Cardio pushes your aerobic capacity to the max. Core and Yoga build stamina, flexibility, and great abs. Consult your physician and follow all safety instructions before beginning any exercise program. †Results vary. Exercise and proper diet are necessary to achieve and maintain weight loss and muscle definition. *This product contains natural rubber latex which may cause allergic reactions. PowerStands is a registered trademark of Tony Horton.